Play The Game of Life, celebrity style! How will you make it in The Game of Life Fame Edition? Will you be a supermodel, a pop singer, a pro athlete or a movie star? Travel along the star-studded path in your stretch limo while building an entourage, making money and elevating your star status! Spin to win for added fame and fortune. Spend your cash wisely on your road to fame and collect 5 stars to win! It's The Game of Life, celebrity style. Will you be a pro athlete or a movie director? An artist or a supermodel? 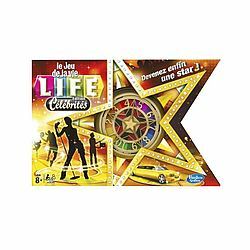 Whatever career you choose, you can live the lifestyle of a star by playing The Game of Life Fame Edition! Choose the right crew to help you get to the top! Pop silver pegs into your limo as you add members to your entourage. Get an agent, a stylist or a personal assistant, and they will get you money, fame and access to the best events! Spin to Win and pick Action cards for laugh-out-loud interactive game play. Sing a song, strut your dance moves, or rap an acceptance speech. You'll do it all to be the megastar winner! 1 Gameboard (double-sided and in 5 pieces), 1 Spinner, 1 Money Pack, 12 Career Cards, 20 Star Cards, 58 Action Cards, 30 Entourage Cards, 35 Silver Entourage Pegs, 8 Gold Player Pegs, 4 Cars, 1 Storage Bag and Game Guide.